I remember that day. Shawn and I were out for a run in our quiet Texas neighborhood. We had celebrated our first wedding anniversary, graduated from college, and pinned on his shiny new Lieutenant bars the month before. Life had finally slowed to an easy pace of waiting for the next thing -our first military move would take us to Quantico in a few weeks time. Life was so normal that morning. Until it wasn't. I remember rounding the corner at the stop sign near the Campbell's house and seeing Pappy in his truck. He pulled up to us, and with tears in his eyes, told us about the planes, the towers, the pentagon. I don't know but it's not good he said, shaking his head. We walked down the street to the house, wondering. We watched on tv, confused. We drove to work a short while later and heard words we couldn't even fathom, towers falling. As a brand new Marine Corps wife in 2001, I had yet to experience anything military beyond Shawn's commissioning day and the rude awakening that was uniform price tags. Before marrying, we had talked about possibilities and expectations for our life together. We talked about separations, wars, things he might be called upon to do, places he might have to go, but in that time of relative peace, how could we truly be prepared for what lay ahead? Since then, we've faced all of the things we talked about and then some. I think we know now that you can't truly be prepared, you can only believe that the One who called you to this place will never leave you nor forsake you. In the face of chaos and things unfathomable, He is unchanging. 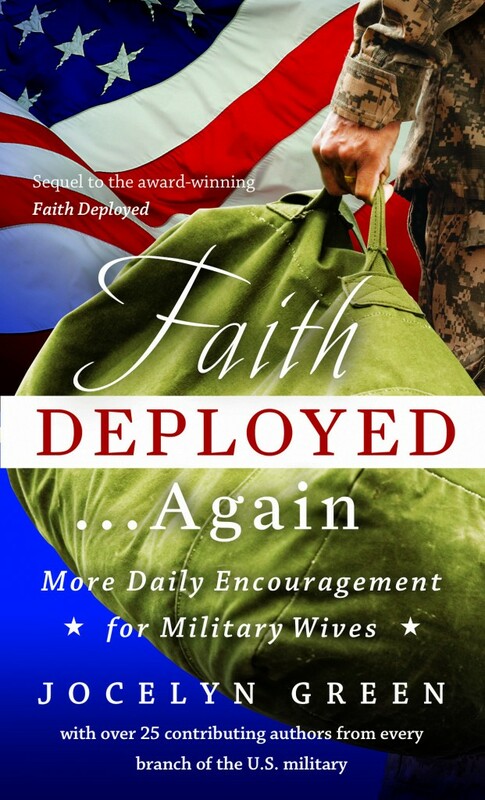 In her new book, Faith Deployed...Again, Jocelyn Green, along with contributing authors from every branch of service, offers wisdom and encouragement for military wives. Written by military wives for military wives and "dedicated especially to those who's lives have been drastically altered since the terrorist attacks on September 11, 2001", this is one book I am eager to recommend. Reading it was like standing around a warm kitchen, talking late into the night with girlfriends who have been there -they get it. Their stories are honest and real, their advice rich and worth remembering, and every chapter centers on scriptural truth. I found myself marking pages, underlining passages and going online to read more on their blogs. I didn't want the conversations to end. The stories of these woman are unique but each one pointed me towards the steadfast love of God and reminded me that I live to bring glory and honor to His name, no matter the circumstances. Jocelyn has provided me with one copy of Faith Deployed...Again to give away this week so I want to hear from you (all of you!) How did that day ten years ago change your life? Where were you? What do you remember? For my military sisters -what's your story? What (or Who) has been your greatest encouragement along the way? Everyone who comments will be entered to win a copy. If you don't think you can benefit from this book, I would dare to disagree, but it would also be a fantastic gift for a military spouse or mom in your life so please, join the conversation. Oh Kelli - like you we were newlyweds, 2 months! Mike was in the reserves at the time, preparing for OSC and TBS. I was at work in my cubicle when he called and then glued to the TV the entire day. Horrific. I remember those days, weeks, months to come feeling terrified my new husband would be off to war. It gave Marine wife a whole new meaning. We have lived through deployments, suffered a miscarriage apart, the deaths of both our fathers apart, and many sad and happy moments apart. But we know that this is the life God has called us for, called him for. He is a Marine. And I am his wife. 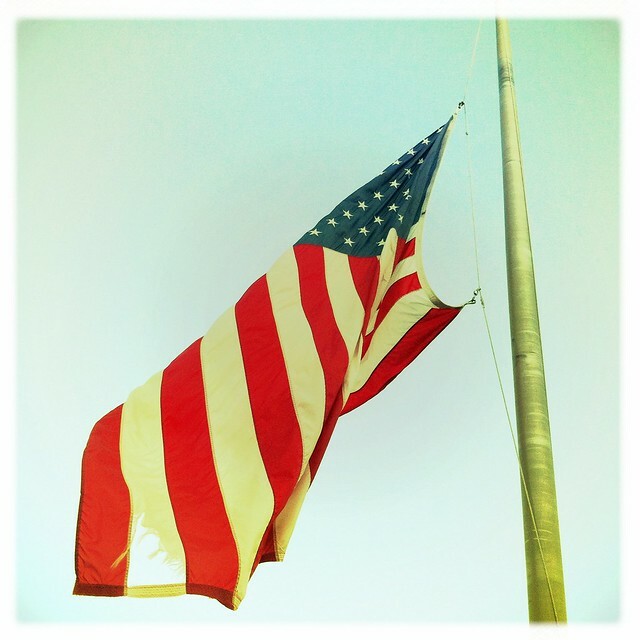 For better or worse, wartime and peacetime. Great Post! You military Wives are all amazing! Fantastic post Kelli. I think of all of those who sacrific and am thankful. Thank you for being a strong military wife. We were working at a Christian school in Milwaukee WI 10 years ago. That awful day solidified our answer to our prayer to join the Marine Corps. A year later we changed our career paths and have had a beautiful journey....4 kids and lots of friends/family later. I remember that day like it was yesterday. I was pregnant with my second baby. I watched the TV with my jaw on the floor. What does this mean? I was wondering as Tim had just finished flight school. A year and a few months later we were home in NJ on Christmas leave when Tim's command called and said we were to come straight back to New River. Now I knew! They deployed shortly after that. The ships waited in the Persian Gulf for the Commander in Chief to give the order. I remember tears falling down my face as I watched President Bush say that we were going to war. Wow! It's emotional to think back, thanks Kelly.:-). Miss you! Great post! Oh man. In 2001 I was about as far from military life as I could get. Would've never thought I'd have become a military wife, sister, and friend just 10 years later. I'm wowed every day by our active-duty military and their families. Sounds like a great book, and this is a great post. :) Thanks, Kelli! Kelli, great post!!! I was a first grade teacher. I was putting out worksheets writing up daily announcements and getting the room ready for an onslaught of twenty seven 6 and 7 year olds. I turned the morning news on as usual when I heard the breaking news. I tried to piece together what on earth they were talking about, was it real? My classroom was the first one as you walked into the school so the teachers would often gather and chat in my room. This time there was no chatting just silence as one by one more people gathered in absolute disbelief. School was to start in minutes. What do I tell the children when they ask? How do I explain this tragedy? I was dating a guy with a flight contract with the Marine Corps. I wondered how this moment would forever change history. What would this mean for him, for us. 10 years later it has meant years worth of deployments, 2 of our kids born during deployments, 6 moves, and the most precious friendships that have weathered the test of time and space. I love your blog. I was a college freshman heading to class in Philadelphia when a friend and i passed a radio that was on. We thought it must be a joke, like a cessna hit an empty barn or something. Then after class, everything was different. Crowds and chaos and I remember hugging a hysterical stranger with giant hoop earrings who was from Manhatten. I didn't know then that I would marry a Marine and that 9/11 would dictate our next decade of deployments! Beautiful blog!! I was getting ready to teach my high school math class. A fellow teacher ran in my room and asked if I had heard what had happened. We sat there stunned searching for answers on the internet trying to make sense of it all. Little did we know that it would be this event that Lord used to lead my then fiance to join the Marine Corp and what kind of impact that would have on our lives over these past 10 years. There is nothing like being encouraged during that time. I have been there and know how hard it is. Thank you for that post!